The Holiday Season is here and, along with the good cheer that comes with it, there’s also plenty of good food (and very likely, also drinks!) too to be had. While turkey, ham, roast beef and other similar table fare are at the heart of the traditional English/American Holiday feast, many other cultures turn to the sea or their fresh waters for Christmas dinner ideas. But many Americans are now also adding seafood to their Holiday dinner menu for what some might call a non-traditional Christmas dinner. Whether for health reasons or just to shake up things a little, many people will be serving fish or something else from our waters this Holiday Season. 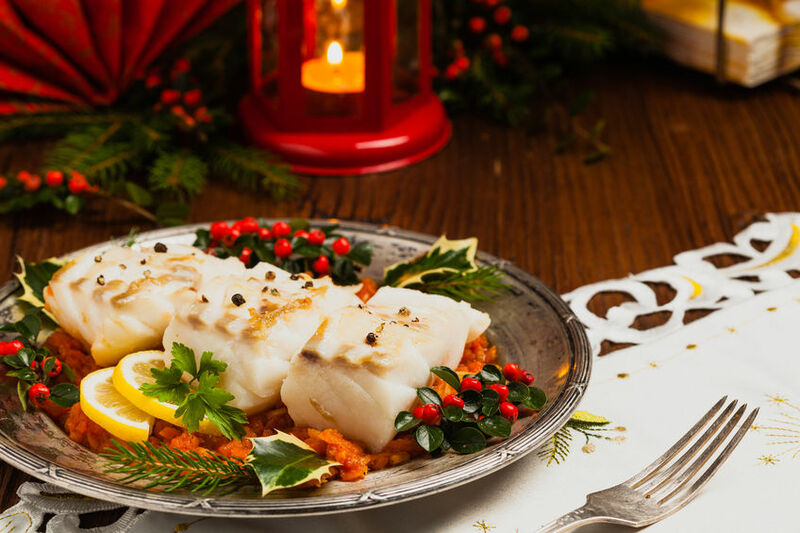 For those of you who would like to also shake up your Holiday menu this year, we’ve put together 3 tasty and easy to make Christmas Holiday fish/seafood recipes for you to try out. Fry bacon in a large skillet over medium heat until nice and crisp. Transfer to paper towels to drain excess oil. Heat about 2 tablespoons of olive oil in the same skillet with the bacon drippings. Heat over medium-high. Meanwhile, rinse the cod fillets and pat dry with a paper towel. Generously season both sides with salt and black pepper. Add cod fillets to the pan when hot and cook for 4-5 minutes. Flip and cook for an additional 4-5 minutes or until fish easily flakes with a fork. Transfer the lettuce to a large salad bowl with the spinach, blueberries, and red onion. Toss. Whisk the olive oil, lemon juice, and zest in a small bowl until thoroughly mixed to make the vinaigrette. Season to taste with salt and black pepper. Whisk again. Drizzle vinaigrette over the salad. Serve salad on each Plate. Top each serving with a cod fillet and 2-3 slices of bacon. Feel free to crumble bacon. Add more vinaigrette if desired and serve. Salt the water once boiling. Add the shrimp to the boiling water and cook for about 2 minutes or until they just start to turn pink in color. Remove from the water and immediately cold shock under cold water or in a prepared ice bath. Dry shrimp and transfer to a stainless steel or another nonreactive bowl along with the cucumber, jalapeno, lime juice, and red onion. Stir to ensure everything is coated with lime juice and refrigerate for at least one hour. Remove from the refrigerator and stir in the olive oil, avocado, and diced tomato. Season with salt and black pepper. Stir. Refrigerate for an additional 30-40 minutes. Meanwhile, add butter to a small pan and melt over medium-high heat. Toss in the garlic once melted. Wait for the butter to foam. Reduce heat to low and let brown. Remove from the heat once golden color. Season fillets on both sides with salt and black pepper. Place each salmon fillet in the center of a sheet of foil and lightly brush with soy sauce. Drizzle each fillet with garlic butter and evenly distribute the green beans. Season green beans to taste with a pinch of salt and black pepper. Seal the foil packets, place on a baking sheet and bake for 20-25 minutes. Fish is done when it easily flakes with a fork. This entry was posted in Reel Seafood Recipes on December 21, 2017 by Dorado.